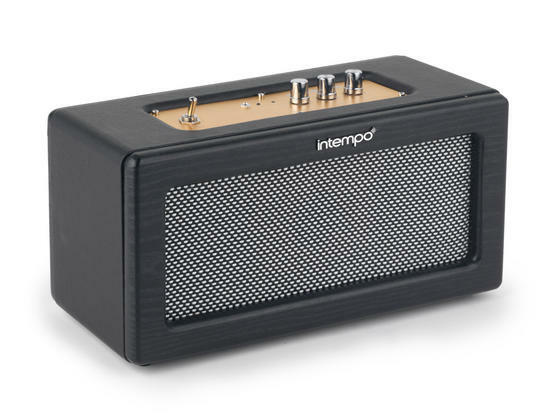 Listen to your favourite music and radio with this Intempo speaker, its retro black and silver design will look great in any room or at the centre of any party. Simply connect your smartphone, MP3 player or tablet using bluetooth technology for hours of uninterrupted audio. Unwind listening to your favourite tracks after a long day at work or turn up the volume to enjoy with family and friends – the speaker has an AUX-in function as well as wireless pairing for quick and effortless connectivity. Perfect for parties or relaxing with your favourite albums and artists every day, just add this retro Intempo speaker to your home. Pair your smartphone, tablet or MP3 player using the versatile AUX-in function or via bluetooth for conveniently cordless sound. The speaker has independent controls for adjusting the volume, treble and bass to your preference, for outstanding sound quality. The sturdy wooden exterior is wonderfully durable and has a black and silver leather-look finish to easily match any setting or style.